I am very happy with this latest buy of mine. Hubby allowed my daughter and I to go out shopping and have fun the other day. I bought clothes for the little one and then a pair of shoes and this mustard bag for myself. I like this bag so much because it has genuine leather material. I thought it's local made since it carries SM's WWW tag. 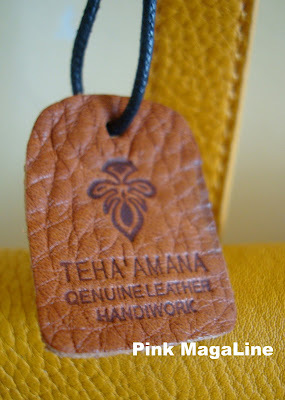 After checking, it turns out that this bag came from Osaka, Japan, home of Teha' Amana bags. The logo tells it all. P649.75 only. I know, it is unbelievable! 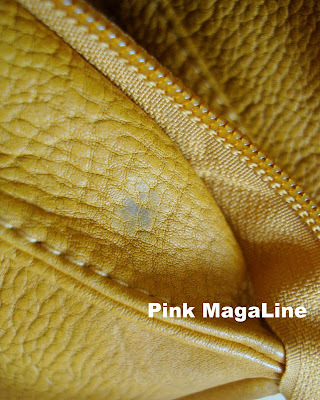 To see if the material is faux leather, I burned the inner part and scratched it. The color faded a bit but it did not wrinkle or anything. 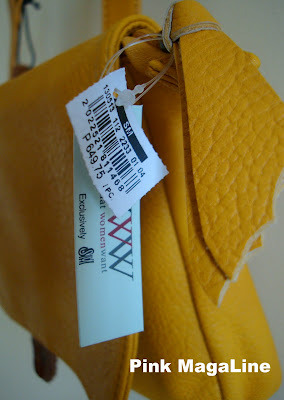 Yay, it is genuine leather nga! I just wondered why SM sells this bag in a very low price. 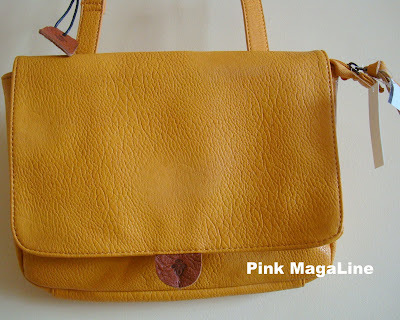 A genuine leather bag which is also imported for only P649.75? It is a total steal! Remember I paid also around P600 for a genuine leather wallet last month? They are comparable in quality and price. So, if you wish to have the same bag, go to the accessories section and not the bag sections of SM Dept. Store. It is right where you see belts and clutches. This bag is also available in teal color. Go shopping now! Such a great purchase:) Love the color of the bag! wow, i have no idea how to check if the leather is genuine or not, thanks for the tip. wow! ganda! great find this week! I hope to see one too when I shop at the nearest branch. The traffic is unbearable, too tired of going out.. I'm foinf a giveaway now, and I'd love it if you could participate! I love your bag! I've been fancied by mustard colored bags for quite a while now, and getting a genuine leather bag for less than a thousand is really a steal! :) Will definitely head to SM Dept. Store soon. thank you for stop by me!I'm following you now! Whoa... when I saw that burnt mark, I thought it was damaged when you bought it. So that's how you check if it's genuine leather, eh? Not sure if I can do that to anything I just bought though. And yeah, for Php 600+, what a deal! The strap design makes it convertible to various carrying preferences, right? I can't see if there's something you can adjust pa dun sa top ng strap eh. I prefer buying bags kasi that I can carry as a shoulder or body bag when I need to eh. that's a really nice deal, i just bought my son a brand new pair of sneakers today but i shied away from the bags because i don't really wanna overspend today hehehe. i believe they marked it down to make a sale because of new stocks, just my presumptions. WOW cool!! gnun pla un pag check if leather tlga :D heheheh salamt sa visit sa hobbylovey ko :D mwah! this is indeed a great steal! 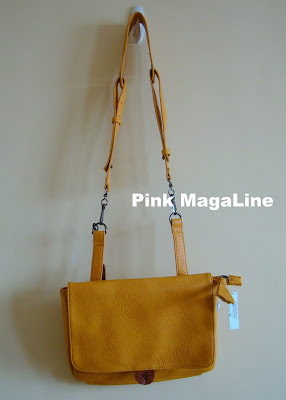 genuine leather bag for just Php 600? such a great find!